Changing your roofline can have a dramatic influence on the overall appearance of your home. 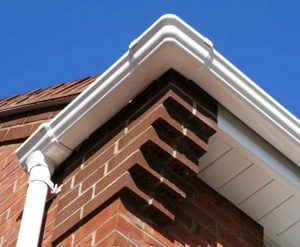 We have everything to keep your roof looking fantastic with fascias, bargeboards, soffits, downpipes, guttering and uPVC rafter plates. We’ve been in the roofline business for more than 30 years and you can rest assured knowing that your roofline work from us will be of the highest standard available. The quality of the products and components we use offer protection against elements like the sun, draught, rain and even heavy hail. PVC-U RAFTER PLATES our fascias are installed on PVC-U rafter plates screwed to the timber rafters. This gives a stronger join rather than relying on the softer timber. We use stainless steel nails to fix the fascias to the PVC-U rafter plate. The benefits of this method are a true line ensuring the fascia is mounted straight with the rafter ends and a more efficient gutter line. This ensure the rafter end and wall plate are protected.